Rockefeller Center is the heart of New York City’s holiday spirit. Located between Times Square and the spectacular 5th Avenue holiday window displays, there’s simply no better place to experience the most magical time of the year in New York. 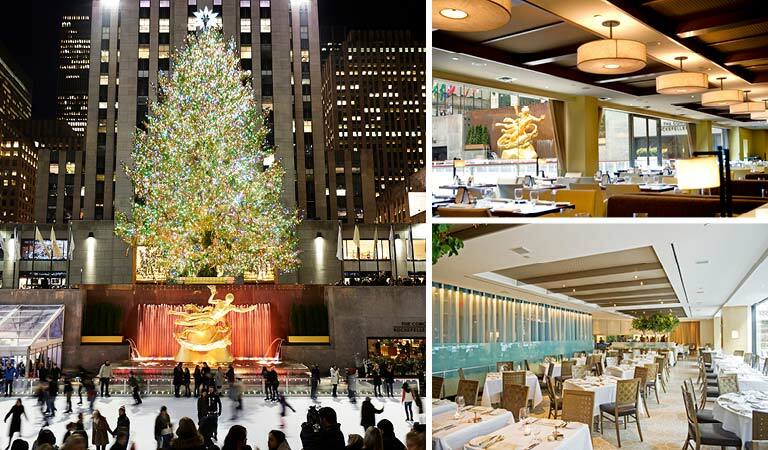 There are plenty of restaurants near Rock Center, but only our iconic restaurants offer exceptional food along with rink-side views of the ice-skating rink at Rockefeller Center and the Rockefeller Center Christmas Tree. Plus, we have tons of exclusive ice skating and dining packages for any time of day - at a great value! Check out our restaurant info below and visit TheRinkAtRockCenter.com to reserve skating and dining experiences. Email us to be the first to know when reservations open up for 2019 holiday season, or just check back here for more information and menus as they become available. Open daily for breakfast lunch, dinner and drinks, this landmark restaurant offers seasonal American cuisine, steaks and housemade pastas, along with house-crafted cocktails and New York’s top brews in a classic NYC ambiance overlooking the rink. Chef Bennett offers the finest seafood in the city at this iconic rink-side location. Guests will enjoy fresh, innovative dishes alongside Sea Grill classics from the restaurants 30+ years of culinary excellence, served in a stylish, elegant dining room. Cucina's retail marketplace is open for breakfast and lunch, the perfect stop for a quick bite on the go in the heart of Rockefeller Center. The modestly priced dining room menu features a range of delicious options, from satisfying salads to rotisserie chicken, fish and chips to flatiron steak.